In-application payments are being touted as the next big thing, enabling mobile application developers to generate new revenue. This is one use case in the broader area of mobile payments, which has been a fertile ground for standards activities and technology innovations for many years, but despite being heralded by pundits and trialled in many forms has never taken off in a big way. 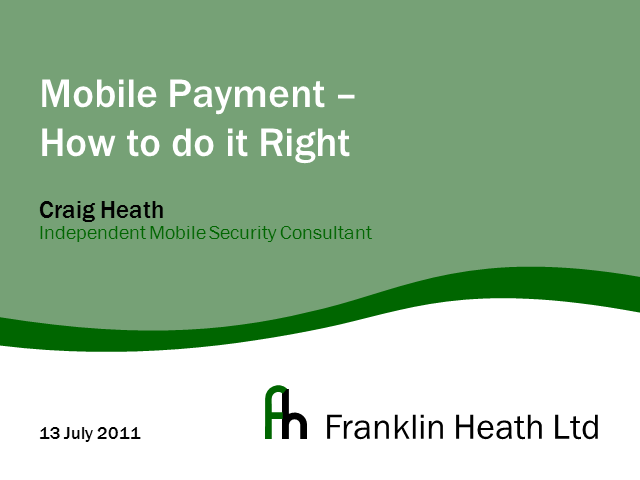 This presentation will consider whether we are now reaching the tipping point, and whether current deployments are properly considering the security needs of end users at one end and the required mobile platform technology at the other. Craig has over 20 years experience in the field of information security, in consumer, business, government and defence sectors. He has worked at all levels of product creation, from strategy through requirements management, architecture and design, down to low-level implementation. Craig brings a broad perspective of the context in which security technologies are deployed, considering economic and social factors to ensure that security measures are effective as well as correctly implemented. He is also an accomplished communicator, able to brief executives at board level, to present or review technical designs, and to explain security to users.